A Different Kind Of Life In The Country. River is a regular commentor here on the blog but does not have a blog of her own. When I knew I’d be moving I sat down and thought – who would I like to guest post on the blog? River was one of the first people I thought of. :) Please take a moment to show River some comment love – she shows us plenty on a regular basis but we usually can’t return it so now is your chance! My first husband was in the Army. Between 1972 and 1986 we moved house 6 times. You’d think it would be hard, but no, the Army made it all sooo easy. K. would come home and announce he had been posted to a new area. The very next day he would go off to work and I would start cleaning walls and doors. A few days later the inventory pages would arrive. That’s right- pages, plural. 11 of them. EVERY SINGLE THING WE OWNED had to be listed along with the condition and approximate value. This is where I discovered that we owned 2 dozen unused wine glasses and 500 books. Furniture items had to be closely examined and every nick , dent and stain written in the available space. Then there were the personal items, clothes, toys etc. Here we had to estimate how many boxes we would need to pack all these into. So I went merrily about the house, spending about ½ a day per room, listing everything. At the end I thought I had done a pretty good job and walked around patting myself on the back. Until K. pointed out that several of the items listed to go in the truck were items that we needed to take with us in the car. The pram, the highchair, the 4 dozen nappies. I crossed them off the inventory. The pages were submitted and a moving date was set. The day before the move the packers arrived. Yes, packers. 4 hefty looking women who packed up Army families for a living. I watched, astounded, as they packed up my entire house in mountains of paper and stuffed everything into large sturdy cardboard cartons, in LESS than ½ a day!!. I didn’t have to do a thing except make cups of tea for them. We spent the night in a cheap motel, paid for by the Army. This was part of the moving process. A cost was estimated on number of family members, to be used for motel accomodation and meals also an allowance for petrol. Early next morning the truck arrived, loaded up and vanished. We drove to Sydney from Brisbane. Although, since I never learnt to drive it was up to K. to get us there safely. We arrived in Sydney 2 days later and spent a week in a motel. K. went off to work every morning and I was left alone in a city I didn’t know, with 2 babies, minimal clothes and toys and hour of daylight to get through. We managed to have fun anyway although I can’t remember now what we did. Then we learned a house in the suburbs had been assigned to us, all the way out in Glenfield, past Liverpool. K. was working at the Watson’s Bay base. Hours and hours of travelling for him, leaving at the crack of dawn and getting home in time to kiss the babies goodnight. So we settled in. another baby came along and No.1 child started school. Then K. came home one day and announced he had accepted a posting to a new area. And the whole process was begun again. Only this time the inventory list was easier. I’d kept a copy of the previous one and only had to transfer stuff we still had, add new things acquired, and omit stuff we had gotten rid of. Simple, really. The process was repeated several times in the next few years as we moved from Sydney to Melbourne, back to Sydney, back again to Melbourne etc. Eventually we settled in Adelaide where K’s military career came to an end. After so many years in such a structured lifestyle, “free” life was so much different and many adjustments needed to be made. Looking back on those years now, I’m surprised at how well the children handled it. Every couple of years they were uprooted, leaving friends, changing schools, making new friends, and they did it all (mostly) cheerfully, with few complaints and in later moves even packing and unpacking their own personal items alongside the professional packers. They thought it was fun to live in a motel for a week or so at a time while waiting for a house to be assigned. They watched a lot of tv it’s true, but they also saw a lot of different areas and made many friends, some of whom my oldest keeps in touch with even now. I’m still in Adelaide now, the chidren are grown and gone from home, K. and I divorced years ago. All in all, it was a happy life, that’s just the way things were, getting on with it seemed the best thing to do. I wouldn’t have changed a thing. Thanks for allowing me to post this, River. I am very grateful you agreed to guest post because I wanted to know more about you and I know I’m not the only one. 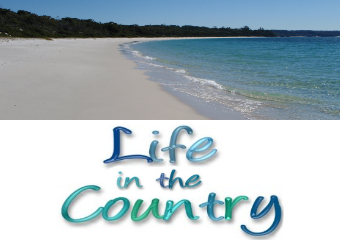 ;) What a wonderful guest post showing a different kind of life in this broad brown land we call Australia. I’ll be back tomorrow with an update on the state of the packing which is going very well, even though I don’t have the burly army ladies to help! Of course on Sunday there’s the weekly wrap up. Pearl Drops By With A Question.. I think it’s amazing that you moved so much and didn’t go crazy! I can’t even handle moving twice in about three years! And making that inventory list would drive me batty, so I think you have a lot of patience and that is to be admired! Many people have told me they are amazed that I coped so well, but I never saw it as such a big deal. K was a soldier when I met him, just back from Vietnam (oh, the nightmares) so I knew beforehand what to expect in terms of moving often etc. It was all just part of the Army lifestyle and getting on with it was the thing you did.I was very young, married at 18 so changes and adjustments were easier I guess than if i’d been older and more “settled”. Oh how I relate! In my first 12 years of marriage I moved house 10 times – though there were only 6 different cities/towns involved. Only on our last move did we have removalists – who also packed for us. I don’t ever want to pack and move myself again. Twice I moved with a 3 week old baby – different babies on each move! It really is a bit horrendous, but like you River, I remember the fun, the joy my children found in unpacking boxes. Oh and hunting for the box with my sewing machine in it after our last move, as I had to sew a school uniform for my daughter the day after we arrived, so she could begin Kindergarten on the first day of school along with all the other Kindies. Ahhhh, the memories. And I’m smiling! Thanks for posting. I saw your comment on my blog and was just wondering to Hubby who you were. It’s wonderful to find out about people who read your own blog! Moving is tough. We’re preparing for a move next year which will be our 8th in 7 years. It doesn’t get any easier, you just seem to get used to it. And my Hubby’s not even in the services!!! Great post and I can totally relate! As a child, my dad was in the U.S. Air Force and we moved at least every two years. Since getting married, my husband and I have moved 5 times for job related moves. My daughter had lived in 3 different states by the time she was 3. I actually feel sorry for people that are moving for the 1st time, it takes organization and upfront planning to make it go smoothly. Hope things are going well for Snoksred! Hi River, you are a great women to move and still have such a good sense of life. I wonder how you have not felt sorry for yourself, like many of us do? It’s great to hear stories like yours, it makes me want to be a better person and not complain about the small things. No matter what moving that many times is tiring and emotionally draining..Good job.. Thanks for sharing and I hope you find peace and happiness. Thanks, all of you, I’m glad you enjoyed my little story. And to Ali, Kin,and Lynne, it sounds as if you’ve moved more often than me, or at least with less time between moves. I had at least 2 years between moves. Isn’t it great how moving gives the perfect opportunity for clearing out useless junk?